Thursday March 28th, The First Pitch! Thursday was an absolutely beautiful day! The sun was shining and the temperature was actually warm enough to wear short sleeves the better part of the day. It was also a great day because Ingram was going to school to celebrate Easter with his friends at GBC. 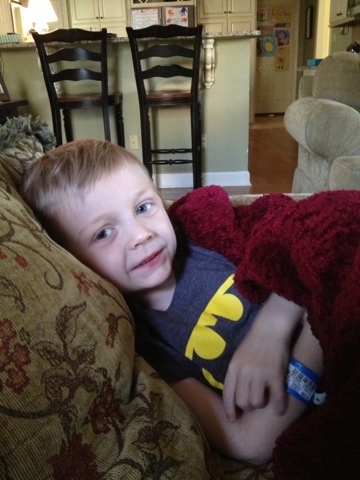 He didn't get to be a part of the class Easter Egg hunt last year, or any other Easter Egg hunt for that matter, since he had his brain tumor surgery on Good Friday and didn't get out of bed until Easter. He came home and talked non-stop about how much fun he had at school and how he got to find the eggs with a "red star" on them to make sure that he had the right ones. He was loving the candy too and started eating it as soon as we got home from school. 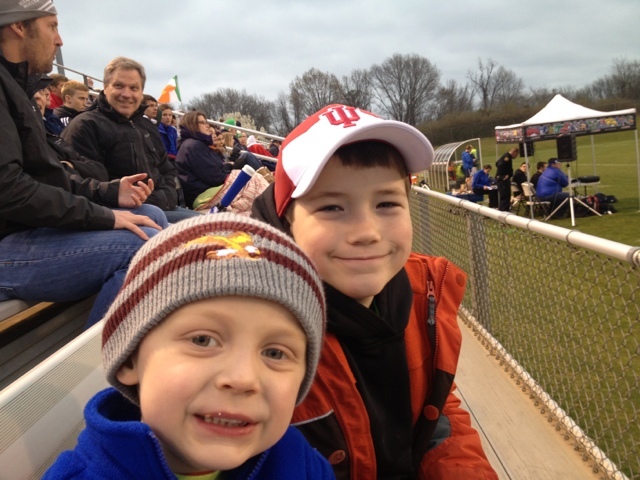 Once the girls got home, it was off to soccer practice for each of them and then to the ECS Baseball game for Ingram to throw out the first pitch! He loves baseball and he loves "Mr. Brent" even more and was so excited to get to throw baseballs with Mr. Brent and his little brother Mr. Josh at the game against St. George's. Lindsey went to a friends house after soccer, but Madison stayed with us and went to the game so she could hang out with Alden (Brent and Josh's sister). Ingram and Madison went out to the Pitcher's Mound with Mr. Brent and Mr. Josh went to Home Plate to catch his pitch and all four of them smiled the whole time they were out there. Mr. Rooker told a little about Ingram's battle and also about the girls' fundraising while they were out there before it was Ingram's turn. He'd been practicing with Craig at home and once Mr. Brent got him to the right spot, Ingram let it loose and threw it all the way to Mr. Josh at home plate. Oh the smile he had on his face was priceless and I'm sure Craig also let out a deep breathe as the ball actually made it to the plate. By the time the sun went down, it was super cold, but Ingram didn't seem to be phased by it and went about playing hide and seek with some bigger boys and then of course played with Madison and Alden too. Ingram was in his MSU Baseball t-shirt and shorts, Madison was in her soccer shorts and goalie jersey but they seemed to keep warm by running around and playing for the most part. Craig and I on the other hand, didn't quite dress warm and ended up with frozen feet by the end of the night; they were the kind of frozen feet that you don't feel if they're hitting the ground or not and took a few hours to thaw out completely. But, with all the fun Ingram and Madison had during the night, I'm pretty sure we'll be back for some more games...when it's warmer outside! Ingram's Super Excited About His Biggest Easter Egg From His Teacher Mrs. Beaudry! Ingram Showing Off His Perfect Form As He Pitches To Josh Rooker! Tackling Is Legal In Baseball Right?? He Gets Away With Everything!!! Now He's Got The Big Boy Bats Out Trying To Show Them How He Can Hit! To Visit The Zoo Sporting Their Team Ingram Shirts! That They're Still In It With Us! Monday, Tuesday, and Wednesday March 25th, 26th, and 27th, Making More Memories! Monday was shaping up to be a beautiful day, super cold but sunny and we were feeling better at our house from the stomach bug. Ingram was ready to go out and do something and he picked "Lunch Date With Mommy!" as his choice for the day. Who could say no to that?? We headed to run a few errands and then ended up at Chick Fil A for a super fun lunch date and the first real bit of food for us since the bug hit. After lunch, we weren't feeling so good so we headed home to take a nap before we had to start with our afternoon chaos of Lindsey's guitar lesson, both girls soccer practice, dinner, homework, and more. The best thing about today, other than our lunch date, was getting to celebrate a sweet friends birthday in a special way. Ramsey and Evie Harrison were born today, the 25th, and Ingram has pretty much loved them since they were born since they're the same age; we also go to church with the Harrison's and they helped Make-A-Wish send Ingram on his trip in January in Evie's memory with donations from "iRun4Evie" and other fundraisers they've done. After soccer and dinner, Daddy and the girls went to Gracie Bleu and met up with lots of friends eating ice cream and donating to Make-A-Wish in Evie and Ramsey's honor at her birthday celebration. The craziest thing about today was that it's officially Spring AND it was snowing IN MEMPHIS!!! The girls and Daddy definitely came home and took hot showers to thaw out after being outside for 2 hours in the freezing cold! Tuesday Ingram went back to school and had a fun time with his friends. After not going to school for so long starting when he first got sick last year, he really hates to miss school and really enjoys time with his friends and teachers. He tells me that he misses me while he's at school, but sometimes, I'm pretty sure he loves his freedom! After school, we had soccer practice for Madison in her new super cool goalie jersey and Lindsey had a game at Mike Rose. We surprised Madison with a blue and green goalie jersey and even had her number put on it; she had mentioned her shoes were tight and I guess Soccer U.S.A. is a lot like Target because you never come out with just the one thing you went looking for and she was so surprised! When we dropped her off at the field, she jumped out of the car and went running while yelling "Coach Hugh! Coach Hugh!" since he was walking through the parking lot too. I guess she was a little more than excited to show him and the others her new jersey! The weather was definitely better for tonight, but it was still a bit cold. 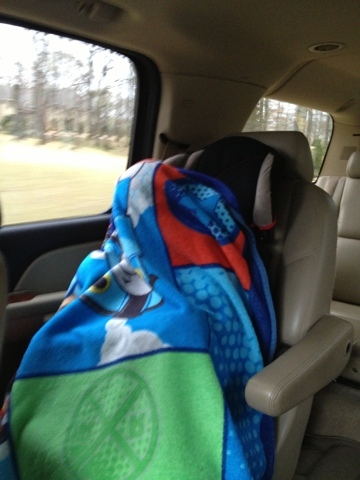 Ingram helped me to warm up by snuggling up under my blanket sitting in my lap while he took a break from baseball. Yep, he brought his baseball stuff to Lindsey's game so that he could play baseball with Daddy while we watched the game. I'm not sure how they watched soccer and hit baseballs because with a ball or a bat in Ingram's hand demands 100% attention so that you don't get knocked out! The only causality of the night was Ingram and he hit his own head when he threw up a "popper" for himself to catch; the only problem is that he didn't catch it with his glove, but instead caught it with his head. Oh well, it just made him even more silly! Wednesday was our St. Jude day and Ingram was so excited! We've decided to start back at Speech Therapy and he's always happy to go to St. Jude for the day. We got there and found out that they were also doing crafts at the ABC Wall, but that it would have to wait until after his lesson. Our regular Mrs. Angela had been sick so she let two other gals do Ingram's session today and he still had fun with them. Then it was off to the crafts where he made a pig out of a ball, stick, and fuzzy rope; he colored it very carefully with "no girl colors" and then off for a grilled cheese we went. He tells everyone they have the best grilled cheese sandwiches at St. Jude and he eats one every day we are there. Of course, he also got his candy from the candy bar in the cafeteria; "to get candy" is the reason he told Mr. Bozeman we were going to SJ today when we were signing papers at school for Madison. What can I say? We all like the candy!! He was also a trooper and went to a "girl" store to look for dresses for his girls for Easter; we already had his Easter suit but he wanted to help pick out the girls' dresses with me. He was so good and played with the cars and dinosaurs at The Pink Door and we even ran into a Mrs. Sally Klinke, a sweet friend from church. We had so much fun at the store and ended up coming home with a dress for the girls and me! The girls loved their dresses and with no soccer on the schedule, we stayed home and enjoyed a fun night at home. I guess this Easter's family picture will be a lot different from last years and we're already getting sentimental about everything that's going on right now since we pretty much missed everything Easter last year. But, we are grateful to be able to have this Easter as a family and celebrate even though we're all a little emotional. Even though last Easter and this Easter are totally different for our family, one thing is still the same...Christ died on the cross for our sins on Good Friday and three days later He rose from the grave on Easter Sunday so that we may have life. For that, we are even more grateful! Lindsey And Madison With Ramsey! Happy Birthday Ramsey And Evie! If You Beat Mommy, You Can Stay Up For An Extra Five Minutes! Nothing Like A Little Nighttime Fun With Speed Training! Even Ingram Got In The Contest For Five Extra Minutes Of Playtime! Sweet New Goalie Jersey...And Yes, She's Reading...Again! An All Boy Colored Pig! Friday, Saturday, and Sunday March 22nd, 23rd, and 24th, Daddy To The Rescue! Well I don't know much of what Ingram did during the day Friday, but I know he had a great day with Daddy! Even though Ingram felt better, he ended up giving me the stomach bug. As soon as he started getting sick early Thursday morning I could not help but think of the fork we shared to eat cake at Ole Miss just hours before; I guess I knew sooner or later it would hit me and it started around 4am. What I do know is that Craig got the girls off to school on time, took care of Beau all day long (Have I said his Invisible Fence hasn't been working lately? ), and took care of Ingram all day while he attempted to work from home. He even did the laundry and got all the dishes from the day to the sink which is huge!! Once I was back to half of my senses around 7pm, I realized how much I missed my people during the day and how grateful I am that I have them; it's just no fun being stuck in the bedroom all by yourself! Saturday morning started out with a bang as Madison had a soccer tournament all weekend...in the cold, in the wind, and in the rain! Craig took her to the early game and I took it easy at home Ingram and Lindsey; after laying low and resting at home for most of Saturday, it was back to the soccer field for two more games. Madison's game was going on while Ingram was at the Stadium waiting for the beginning of "his" game to start. 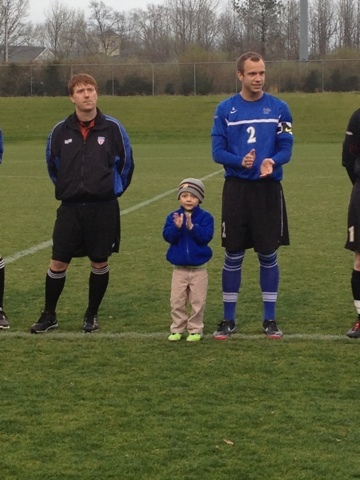 The University of Memphis Men's Soccer Team was playing against Colaiste Ide (Ireland) in Kicks For A Cause which is their annual charity game with donations from the game going to St. Jude. We saw a bunch of our St. Jude friends and Ingram could not wait to walk out on to the field with the team. 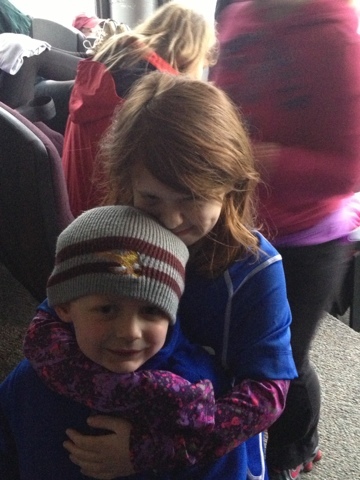 Before we got down to the field, he was running in the Press Box staying warm with our other St. Jude buddies. Alyssa, who had been battling Melanoma and her cousin Tyler, who is newly diagnosed with ALL, had their names on the door and Ingram had lots of fun running around with Alyssa, her brother Luca, and everyone else. Once it was game time, Ingram wound up first in line and walked out with Mark Sherrod, who wore Daddy's lucky number 2 and also played Forward. All the kids were so cute and did a great job hanging with the players during both national anthems. Ingram was so cute too; every time he'd look toward us, he would wave and say "Hey Mom" and "Hey Dad" and go right back to talking with Mark. Once Madison's game was over, her team came down and joined the party in the bleachers as they watched the game until halftime. 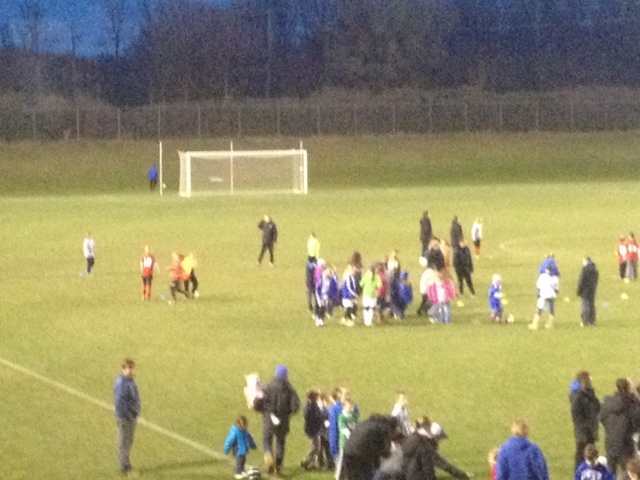 The great thing about halftime was that all the kids got to go out on the field for a training session with the University of Memphis Women's Soccer Team! It was cold, windy, and starting to rain but the kids had a great time rotating between the different sections and of course had a ball playing soccer on the stadium field. By the end of halftime, it was raining harder and felt much colder with the wind blowing so we packed it up and headed home. Apparently it rained during the night because when we got to the fields, they were more than soaked!! And the wind was blowing too but Madison and her team kept playing and made the best of it. 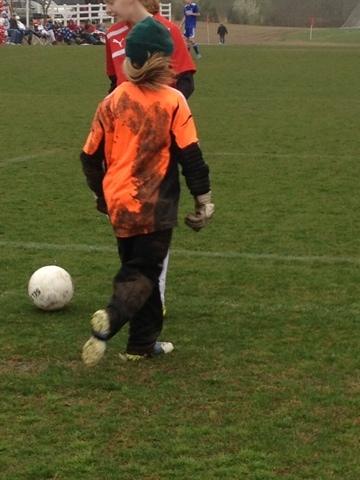 Before her game, Madison was already covered in mud from head to toe from her goalie warm ups and she got even more muddy during the game. 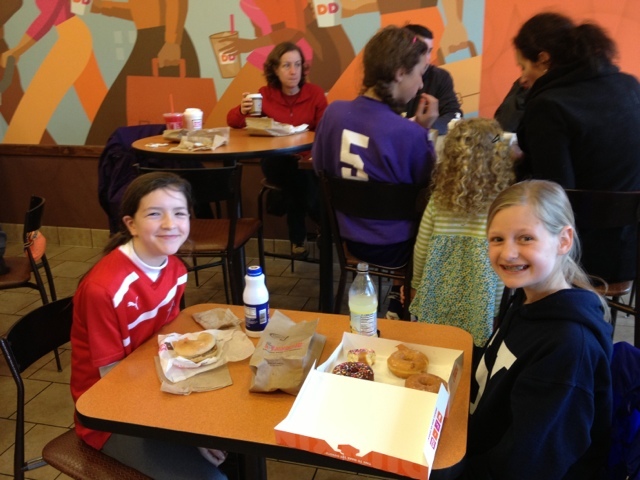 After the game, we headed to Dunkin Donuts for some hot chocolate and donuts with our friends the Whelans and the Makinsters so that we all could warm up from the freezing cold soccer game. We headed home next to take showers and get in pajamas to finish out the rest of our day and attempt to stay warm on a super cold "Spring" day. I mean really, it's officially Spring, but it's cold enough to snow! The kids played all afternoon inside and then we watched basketball with Daddy while we ate dinner and helped Daddy cheer on the Florida Gators. Since the kids had already had their showers and were in pajamas, the Dismuke household actually headed to bed early for a change!! 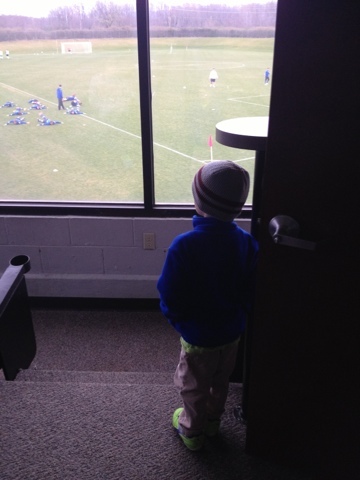 Ingram Waiting In The Warmth Of The "Alyssa And Tyler" Room At The Stadium! Ingram And Mark Sherrod Leading The Teams Out To The Field! Ingram Clapping With Mark When Each Player Is Announced! She's Our Favorite Fellow Red Headed St. Jude Patient!! 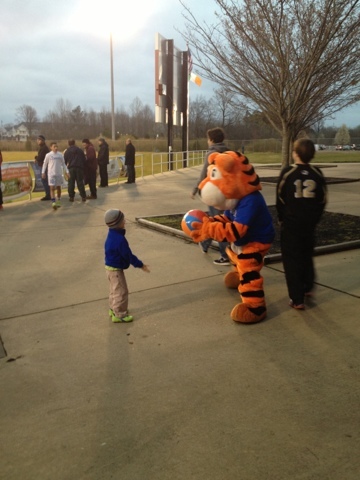 Ingram Was Excited Collin Came Down From Emily And Madison's Game To Hang With Him At The Stadium! 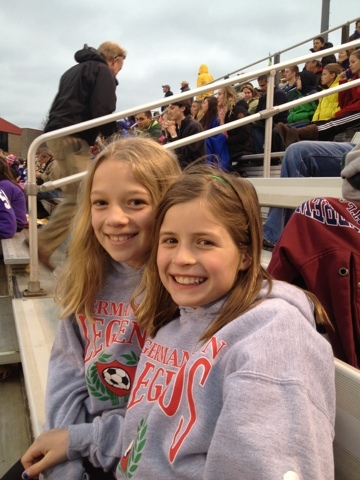 Two Soccer Peas In A Pod! Ingram Finding Another Playmate In The University Of Memphis Tiger! That's Only Half Of Madison's Sunday Mud! 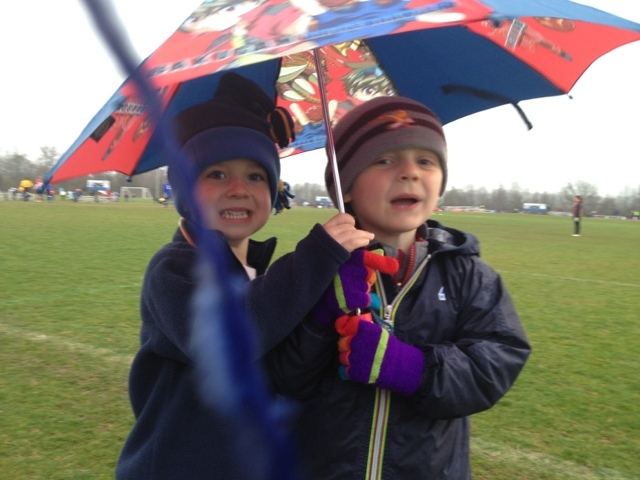 Loving Playing At The Fields...No Matter The Weather! 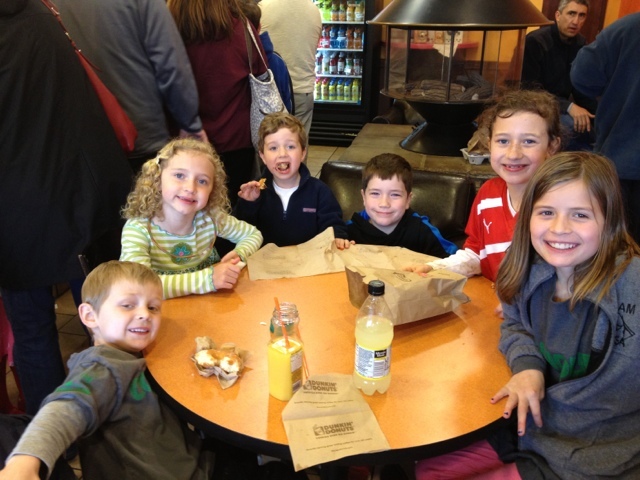 Getting Warm At Dunkin Donuts! Do I Really Need To Explain This?? 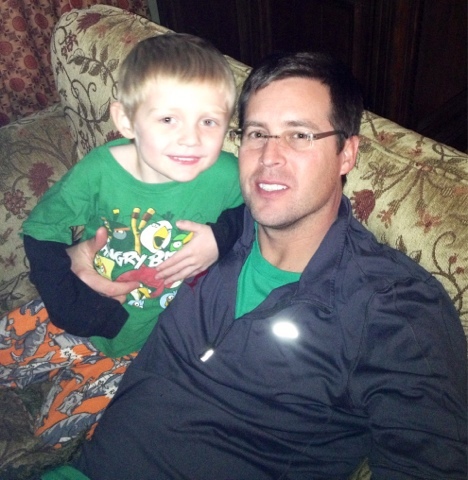 Ingram And Daddy Watching The Game Together! Thursday March 21st, Really? The Stomach Bug? Okay so at 2am, Ingram came downstairs and said he threw up and that he didn't feel good. I carried him upstairs and yes he did...all over the bed! Alrighty then, I changed his clothes, switched out the blankets, and he went back to sleep for about an hour and then we do it all over again and again and again all the way until 9am. The only difference was that towels got placed on top of the growing piles of puke and Ingram got more upset as the "morning" went on. 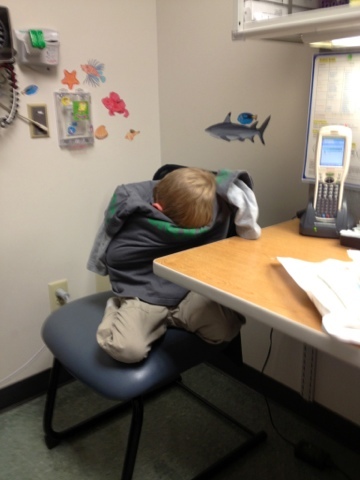 At one point, he asked if we could call his doctors and nurses at St. Jude and tell them he doesn't like throwing up anymore. When he woke up again at 9, he acted like everything was fine and climbed up in the chair with me and Beau to snuggle and watch cartoons. I'm pretty sure that 30 minute window was really the only time he felt the slightest bit chipper all day. He stayed in the chair for the rest of the day except for when he wanted to paint; this was the first time ever that he only painted a couple minutes and then crawled back into the chair and to go back to sleep. I stayed very quiet so I didn't wake him or Beau up; Beau jumped up on the other couch and took a sympathy nap alongside Ingram. After sleeping for a bit, Ingram wanted to watch Power Rangers while he "tried" eating some Cheerios and drinking some Gatorade. He kept his first food of the day down but had some pretty crazy bathroom visits throughout the afternoon, but at least wasn't throwing up anymore. He stayed in his chair and didn't even seem to notice the girls being home from school since he was watching Power Rangers. Since once again the girls had different schedules, Craig took Madison to her games at Mike Rose while I took Lindsey to her practice. Ingram fell asleep on the way home from dropping Peanut off at practice and then again when we went back to pick her up a little later. When we got home at 7:30pm, he walked in and went to bed...in our room so I can check on him all night. Before cancer, I wouldn't think much about Ingram getting sick with a stomach bug like this. But now, my mind is running wild and not going in the right direction. Of course Ingram doesn't want to eat because he thinks he's going to throw up and I don't blame him. Today's throw up wasn't "easy" like during treatment; it was the kind that kept coming and even when there was nothing left, he was dry heaving and just crying because it was hurting him. Seeing him not wanting to play Candyland or with Play-Doh or even paint tells me he's just feeling awful. We're praying he'll wake up in the morning feeling better and that he will eat more than a handful of Cheerios during the course of the day. And hopefully my heart and my mind will calm down too. Pray for all of us "cancer parents" because there's always the thoughts in the back of your mind that can just send you in the wrong direction; once those thoughts get started, they're really hard to stop. But He Didn't Really Sleep From 2am. Watching TV In His Chair! 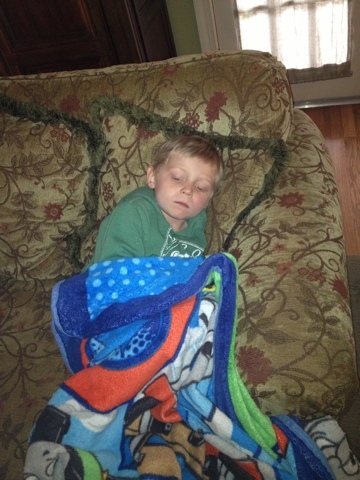 From The Soccer Fields So He Could Go To Sleep! Catching Another cat Nap On The Way To Pick Up Lindsey! 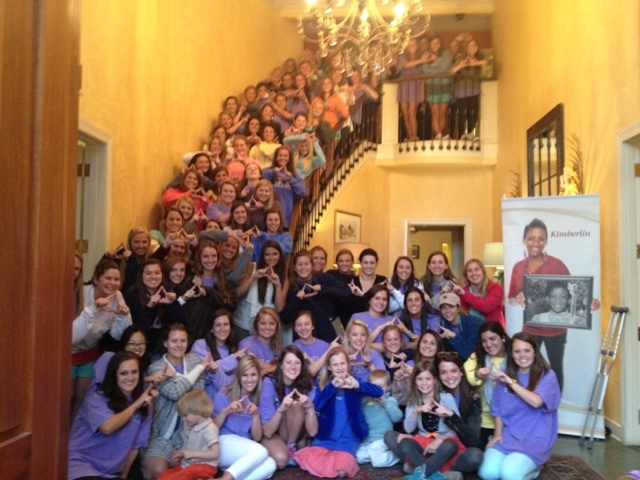 Wednesday March 20th, St. Jude AND Tri Deltas...Does It Get Any Better? To flush or not to flush...that was today's question and Ingram ended up getting flushed. It turned out to be a great day to be at St. Jude and Ingram was so excited about being at "his" St. Jude to play for the day. 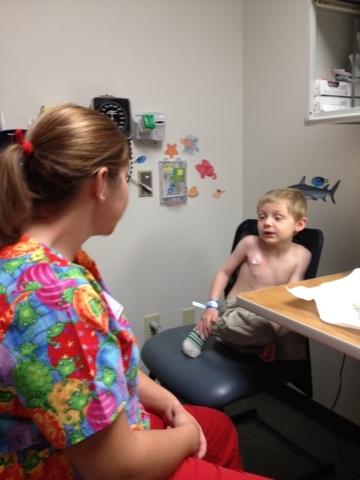 Of course before he could play, Ingram had to get poked for his monthly port flush and it had been exactly a month since we'd be at St. Jude. He definitely was brave today and wanted to sit by himself again to get his poke; the hardest part was deciding what he was going to say for the actual poke itself. First it was "1-2-3-dinosaur" then it was "10-24-dragon" but he settled on "1-2-3 SPD Emergency" for his current favorite Power Rangers show. He butterfly went in without any tears and once he was finished, he was running down the hall for the treasure box. 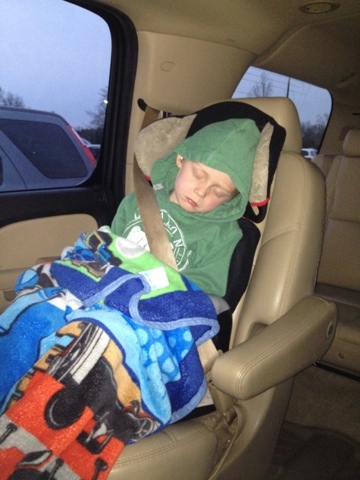 After a quick snack from the cafeteria, Ingram had a lot of fun with Mrs. Angela working hard in his Speech session. Even though he was working, he had Mrs. Angela cracking up with all the stories he was telling; he was even stopping her from showing him how to say specific words by holding up his hand and saying "Wait! Don't show me! Let me show YOU!" Ingram is always a little stud, but today he was quite the fireball too and that's just another reason we love him! Kay Jewelers was also hosting a Jungle Party today for the kids and we just couldn't leave without going to check it out. 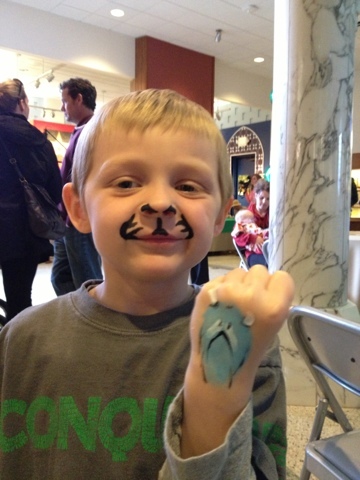 He got his face painted, played games, and ate some lunch; I'm using the term lunch loosely because he only ate a hamburger bun! 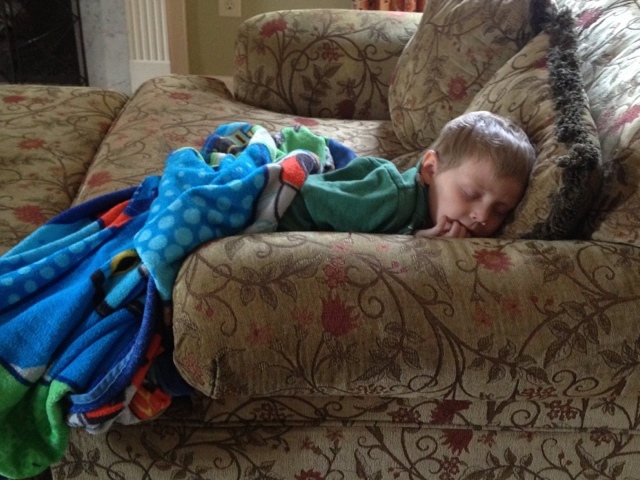 We made it home just in time for a itty bitty nap before we had to leave town for Ole Miss. 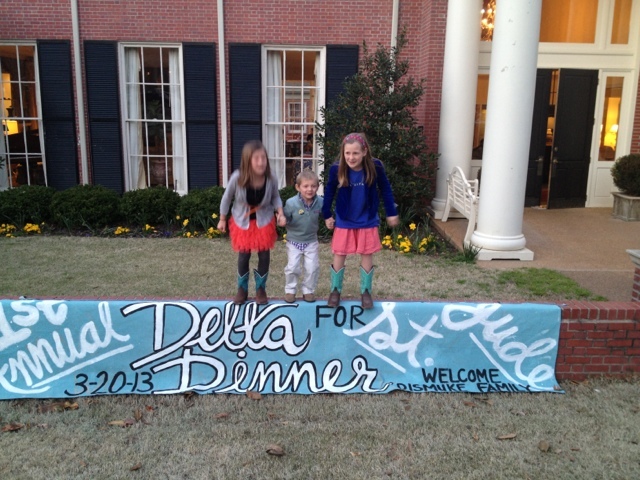 We were going to join the Tri Deltas for their first annual "Delta Dinner for St. Jude" and we were their SJ family! It was so much fun and the kids loved it too; they're turning into professional travelers and we even managed to do homework in the car. 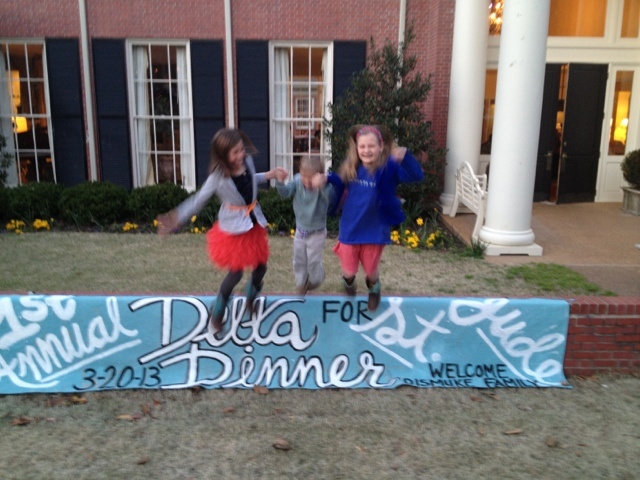 When we got there, they were singing a Delta song as we entered and the kids were running around again. They sat us at the head table and their "house boys" served us dinner family style around the tables. 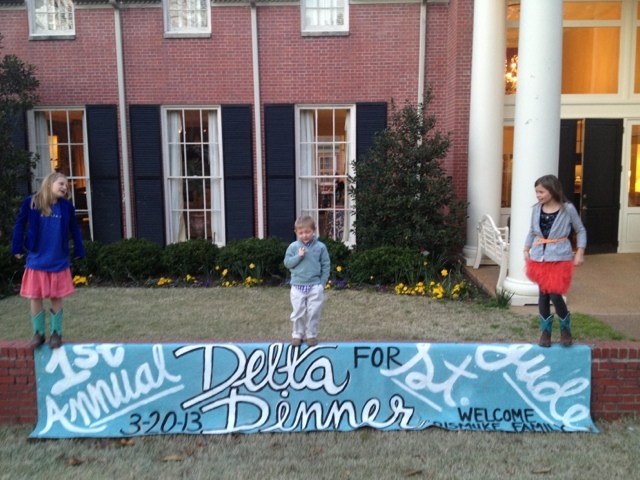 The kids were all given a Tri Delta t-shirt and they made chicken tenders for them while we ate pork tenderloin. Ingram was in roll heaven and ate three Sister Schubert rolls with his green peas before he got the first piece of cake! After everyone was finished with dinner and announcements, Madison stood up, put the head mic on, and away she went telling our story. I know I'm her mother and I've heard her do this more than a few times, but each time she gets my heart melting! She looked like such a big girl talking to all the Tri Deltas and sharing how Ingram being at St. Jude has affected her life. Ingram even went up to her and held her hand while she spoke...that is before he ran off to try and explore the house. 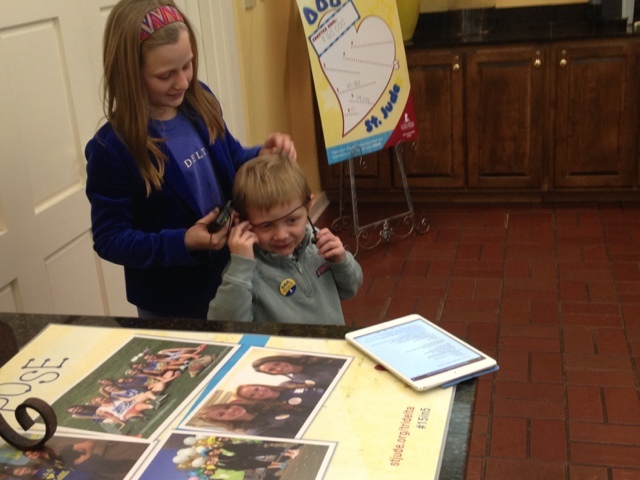 Madison even used him as her example when she turned him around to show the girls where Anaplastic Ependymoma is found and his surgery site. 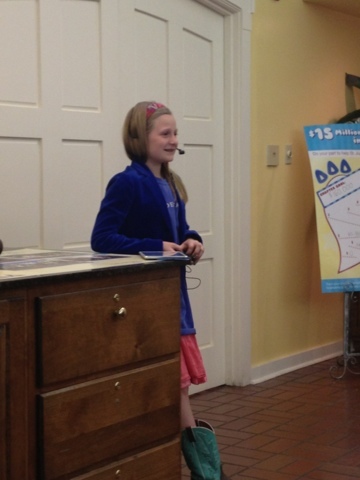 After she spoke, Ingram wanted the head set and told the girls thanks for all the money they'd raised; Craig and I also spoke and Lindsey chimed in as well. Craig was able to show the chapter several pictures of our time at St. Jude and how the money they're raised helps each and every patient. 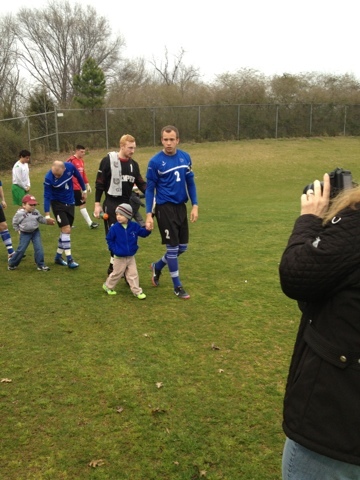 Afterwards, the kids were surrounded with cameras and girls and were 100% loving it! After several minutes of talking inside and taking pictures, we headed to the foyer for a group picture; it took a while, but everyone fit on the stairs and on the floor. We then went outside to take a few more pictures on their brick wall and the kids also found a way to climb the wall and jump off over and over again. Did I mention they had ice cream too?? I'm sure that had nothing to do with their crazy energy once we were outside. It was getting dark and already cold so after all the pictures we piled back in the car and were home by 9pm with the kids in bed before 10pm! Being Mr. Independent, It Took Him About 5 Minutes To Get His Shirt Off! Once Again Chatting Away Talking "Cartoons" While His Numbing Cream Kicks In! 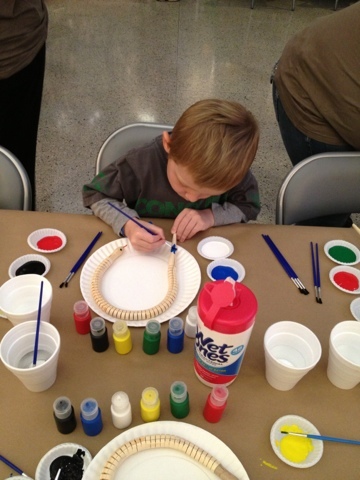 Painting A Snake To Scare Daddy At The Jungle Party! Ingram And A Crochet Club?? Thankfully He Didn't Give It 100% Effort Of The Lady Would Have gotten Knocked Out! "But Madison I Want To Talk!" 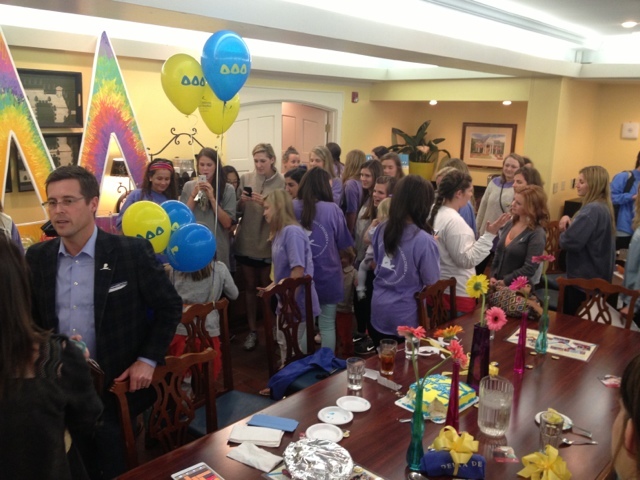 By The Tri Delta Papparazzi...And Loving It! Ingy Poo Front And Center With The Girls! Yes, They're Going To Do It! "No Girls! I'm Counting 1-2-3-Dragon Then We'll Jump!" Monday and Tuesday March 18th and 19th, Playing With Everyone! After our trip to Mississippi State, the kids all slept in a little late but the girls made it on time to school. 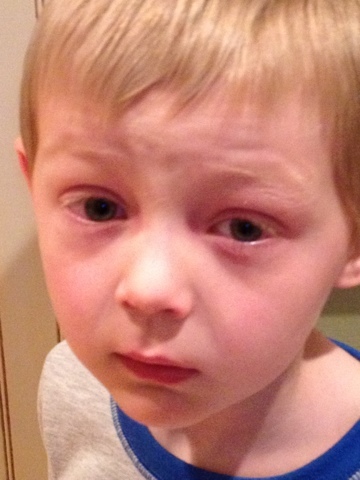 Ingram didn't have school which was good because he woke up with both of his eyes swollen! I guess there's nothing like Benedryl for breakfast followed by waffles and orange juice. 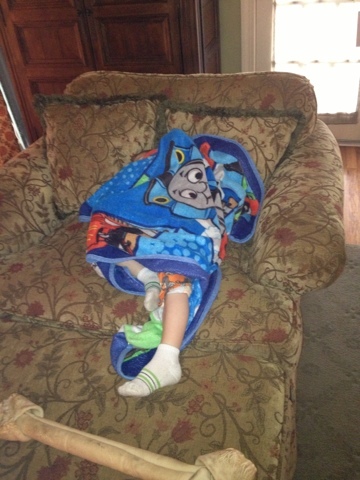 We snuggled in the chair and watched cartoons as we waited for Ingram's eyes to go down. Beau thought it was great and hopped in the middle of us so he could get in on the action. Plus it rained pretty much all day and he wasn't about to go outside in it! After a quick nap, we picked Lindsey up from school and Ingram got to see her at her second guitar practice; of course, most of the time during her lesson, he was playing with his new motorcycle from the MSU Tri Deltas. Tuesday morning Ingram woke up with normal eyes and got himself dressed for school. He's Mr. Independent these days and likes to do it all by himself! After a great school day for all three of the kids, we headed to Mike Rose Soccerplex for a game for both Madison and Lindsey. Madison's game was first and it was chilly, but by the time we got to Lindsey's game it was down right cold! Ingram didn't seem to mind and played nonstop during both games. He played with Mary Grace, Miller, and Hudson during Madison's game with his new Mississippi State football. 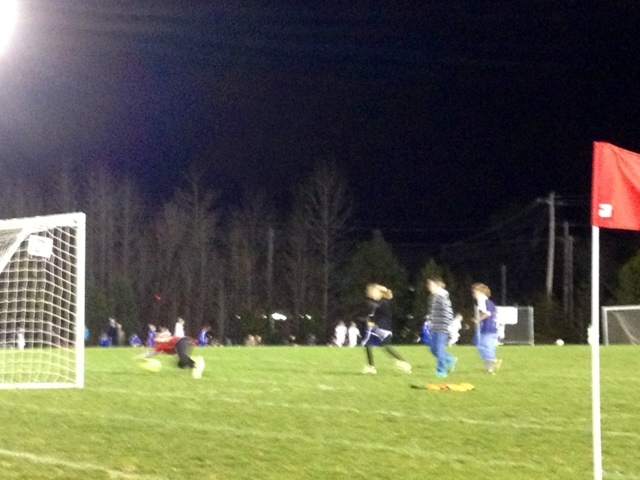 Once we were across at Lindsey's game, he played with Madison and Anna on an empty soccer field. 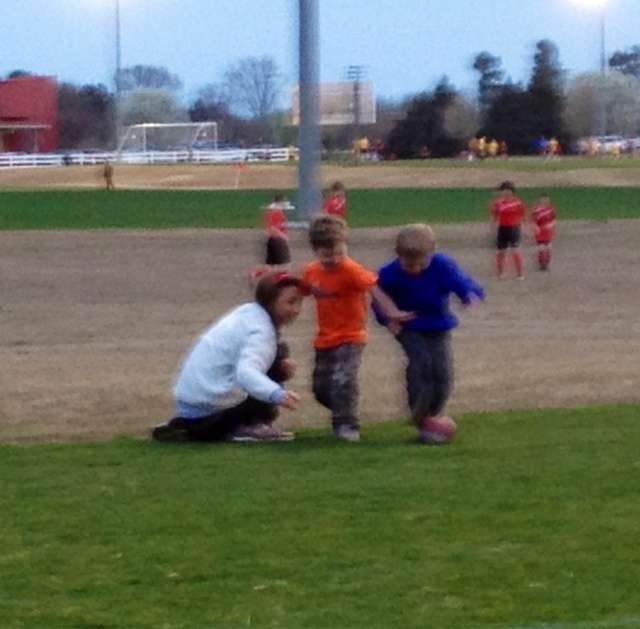 They were having a blast and a few boys came over to join in their game. Ingram was even right in the middle of the action until he got a soccer ball to the face; he already had a football to the eye and I guess in addition to the cold weather, he had reached his limit! Swollen Eyes And A Stopped Up Nose Is No Way To Start The Day! Mary Grace, Hudson, And Ingram! 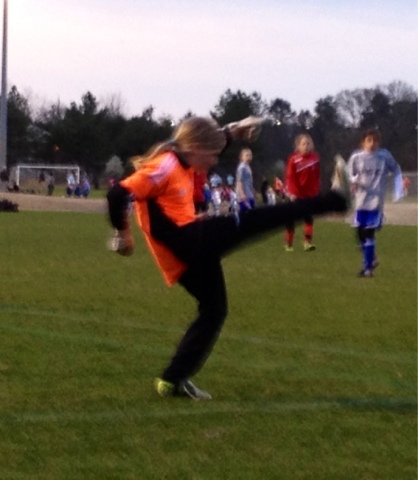 Madison Saved The Goal And Sent The Ball Sailing! 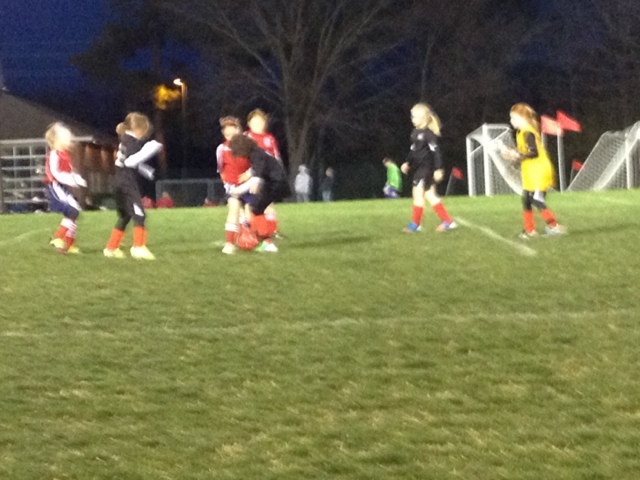 Lindsey's Team In The Midst Of The Battle For The Ball! Madison Stopping Yet Another Goal From The Boys! But He's Still In The Game At This Point! 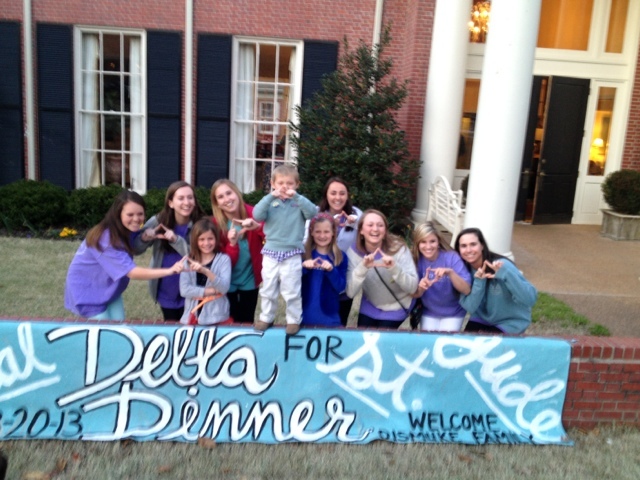 Sunday March 17th, Mississippi State Tri Deltas! 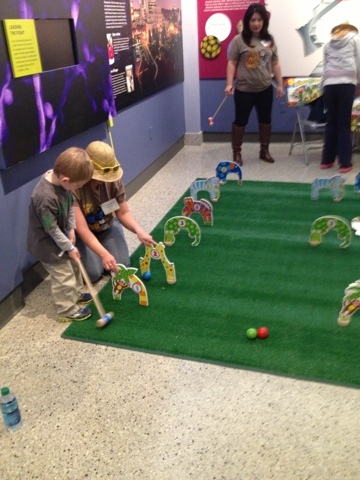 Saturday March 16th, Playing With Daddy! Friday March 15th, Driving Home! Wednesday March 13th, The Downtown Aquarium! Tuesday March 12th, Visiting G-Daddy's Office! Tuesday March 5th, An Extra Treat on Tuesday! Monday March 4th, Magic Monday! Saturday March 2nd, Who Let The Men Out? Friday March 1st, Feeling Better Friday!